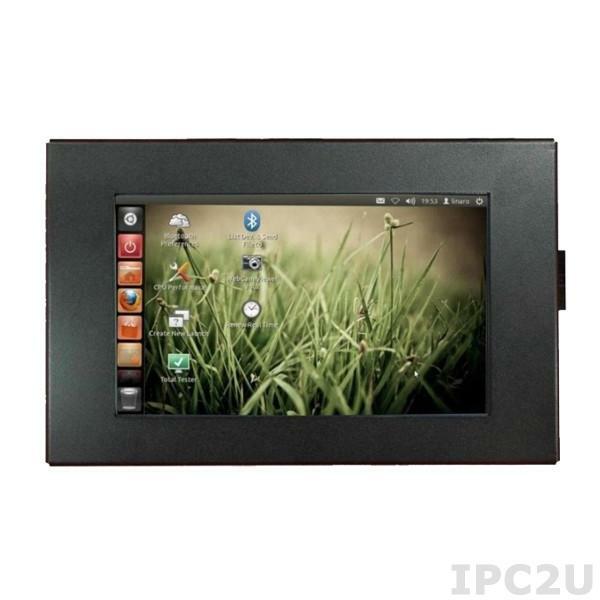 The iROBO-NEC2507WS has a very compact and energy efficient HMI Industrial Panel PC with a 7'' Capacitive touch screen and an ARM Cortex A9 dual-core CPU, 4 GB NAND flash memory, which, via different interfaces such 2xSerial COM GPIO, 3xUSB and LAN features. With a resolution of 1024x600 pixels on a diagonal of 7 inches of iROBO-NEC2507WS allowed, despite its compact size, a high density of detail and supported by a capacitive touch screen surface also multitouch. The 4 GB NAND flash memory can be expanded through a microSD card to provide additional capacity for user data. The two COM ports of compact HMI interfaces each comprise a serial port for RS-232 and RS-485 with DB-9 connector and complemented by triple USB 2.0 for digital peripherals. External circuits can also be integrated via GPIO 8-bit directly into the iROBO-NEC2507WS. For maximum compatibility with the IT infrastructure of compact embedded PC Ubuntu Linux is used as operating system that allows direct access to the repository of the distribution. The iROBO-NEC2507WS is a good candidate as a man-machine interface or HMI as the local process control in industry, automation of buildings or centralized and decentralized monitoring of peripheral devices.